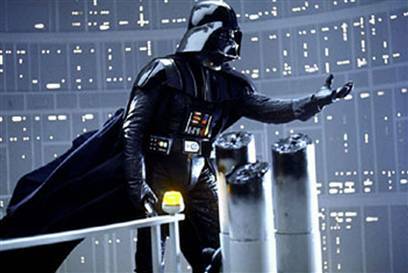 Will Darth Vader Return to the Screen in The New ‘Star Wars’ Films?!?!? So much has been speculated and mentioned over the last couple weeks about the whole Disney purchasing Lucas Films, which includes the ‘Star Wars’ franchise. News came out that they have already begun pre-production on new ‘Star Wars’ films and have even hired a writer. They are wasting no time at all. However, it looks like Darth Vader might be back in action for the new films. So, I guess this will not be Anakin, but actual Vader in the costume. And let’s hope they get James Earl Jones back to the voice, because let’s face it, nobody ever can do a better job than he. Also, Mark Hamill, Carrie Fisher, and Harrison Ford have all been called to reprise their roles as well as Luke Skywalker, Princess Leia, and Han Solo. If this is actually true and is set in stone, it will be good to see Vader on screen again, however I’m not quite sure how it work. At least Lucas won’t be involved. And we have to wonder if Chewbacca, Lando, and the Ewoks will make an appearance. Peter Mayhew Will Be The Wookie Once More In ‘Star Wars VII’!! Disney Announces Unaltered Original ‘Star Wars’ Trilogy on Blu-Ray!!! Film Review: ‘Star Wars: The Force Awakens’! See the ‘Star Wars: The Force Awakens’ Trailer This Thanksgiving Weekend! This entry was posted on Tuesday, November 13th, 2012 at 1:20 pm	and is filed under Film, News. You can follow any responses to this entry through the RSS 2.0 feed. You can skip to the end and leave a response. Pinging is currently not allowed. « The CW Purchases Project Similar to ‘Battle Royale’!!! We got shooters here and here. I tell you an old trick. Draw again. Draw it again. You're the ace field man. Draw it again. It's a simple diagram. Just draw it again. Draw what you saw. Draw it again! Draw it again! [Spence remains silent. Sam takes the marker and draws on the board] Two shooters. Car comes through here. Shooters across each other. Kill each other dead. Oh my, where'd you learn that? The 22nd Special Air Service. What's the color of the boathouse at Hereford? I don't like your attitude! What's - -you got the gun. I'm unarmed. Do something. Go ahead. Do something. DO SOMETHING. Tell me about an ambush. I ambushed you with a cup of coffee!